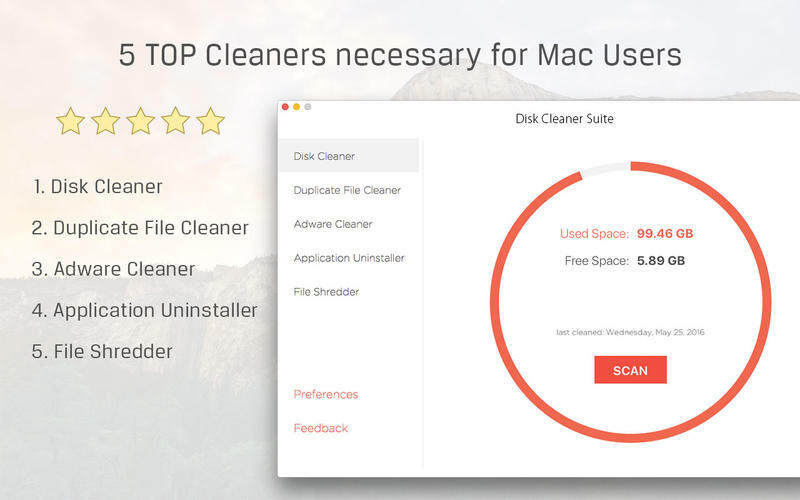 5 Top Cleaners necessary for Mac Users. - Frees up your disk space and makes your Mac run faster. - Cleans and reclaims disk space. - Detects and Cleans Adware and Spyware safely. - Blocks opening strange pop-ups and toolbars made by Adware. - Removes browsers(Safari, Chrome and Firefox) add-ons and extensions opening ads annoyingly. - Restores browsers settings to normal. - Very Quick and Accurate Scan Algorithm of duplicated files or folders. - MD5 checksum file compare. - Scans multiple folders from drag & drop or file selection browser. - Customizable scanning options such as excluding extensions and file size in Preferences. - Intuitive inspection view of duplicated files. - Useful functions such as filter, sort, preview, auto selection for removal and etc. - Cleans duplicated item and reclaim disk space within a few seconds. temporary files such as log, cache, settings, downloads, add-ons and etc in specific locations of disk. Application Uninstaller scans the associated(temporary) files and help you remove them quickly and safely. - Scans applications and associated files. - Intuitive view of application list. - Adds or Remove other application folders in Preferences. - Removes quickly and safely. How do you delete a file? Maybe we move file to Trash and then empty the Trash. This way needs two steps and has problem for security, that is recoverable. If you want one step simple and perfect secure deletion, use this function. - Right-Click items(folder or file) and select "Shred and Delete". - Drag & Drop items on application icon in Dock. We are happy to receive your feedback! We are proud of all cleaners. But we don't think it is enough to meet your needs all. If you have any problems or you want to add new features and cleaners, please email us directly( support@higreensoft.com ). We are always ready to support you 24/7.